Guy Veloso. Ritual de autoflagelação, Bahia, 2014 / Self-flagellation ritual, Brazil, 2014. It may be possible to say that the picturing production of some artists gets closer, intensively, to different poles of the pictorial field, asserting itself through color, light or line, to name a few possibilities. In this case, it is appropriate to say that the work of Guy Veloso choses the work with light. With vibrant and saturated colors, like much of what’s most renowned in the production of the Belem’s artists, his photographs stand to indulge to the full enjoyment of the chromatic game, making his coppery color palette proves through a dense shadow. Such darkness, which offers a nocturnal aura, even for images captured under the blazing sun of noon, would cover up the whole colors, not for the sources of light and shields that reflect and tint its coloring. It is significant therefore that these screens are, in most cases, bodies engaged in rites of belief which are, they, acts of searching for some kind of enlightenment. 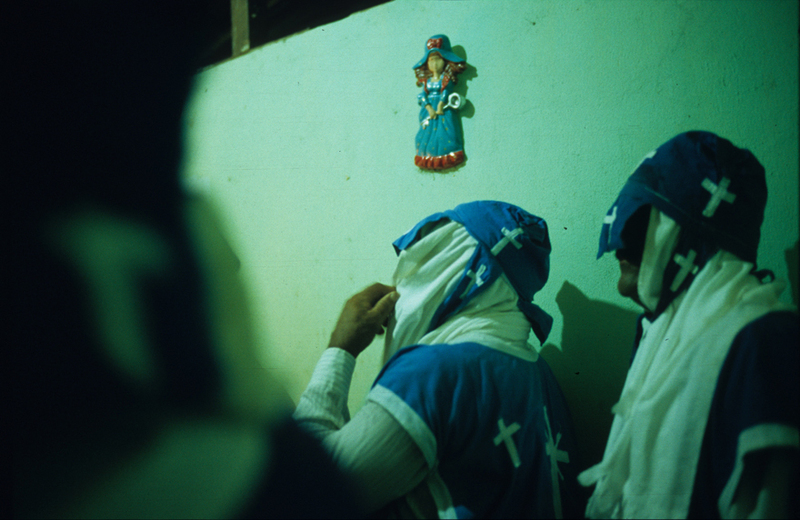 For years involved with a pilgrimage in search of religious activities, cults and pagan celebrations of several kinds, the artist went beyond the comfort line that divorces the curious photographer of a cultural event. Guy Veloso converted into a complicit of, sometimes, contradict acts of belief, and share his services with remarkable assiduity, even those that provoke contradictory reactions to ordinary citizens, like the penitents from the cities of Barbalha, Tomar do Jeru, Juazeiro, Sergipe and Bahia. In these places, he allows his photographs to explore gestures and borderline features, very close to physical exhaustion, pain, delirium and passion – in all the different meanings that the word goes. This effect of complicity is not only the frequency of Guy Veloso’s visits to those rituals, it becomes probable by the very nature of the photographer gestures in relation to the movements around him. Even in less shocking backgrounds, but no less intense, like Círio de Nazaré (Belém – PA), he shoots precisely close the crowd of pilgrimages around the rope that anticipates the passage of the sacred image in translation. Among crashes, stumbles and falls, he takes part of the crowd of constrained bodies, looking for the best views for his 35mm lens. So it’s no wonder that in his extensive collection of photos it can be found images in which diverse events as Círio de Nazaré, Candomble, Carnival, and even ballet, abruptly come to share similar gestures to each other. These are the motions of belief and gestures of the artist that are on the same luminous quality of movement, or, as the artist could want, in the same gesture numinous quality. English version and proof reading: Marcio Rolim. « Penitentes. 29a Bienal de SP/2010.